Hakozaki Summer Bon Odori (箱崎納涼盆踊り) is one of Bon Odori Matsuri in Tokyo. It happen in the middle of August at Hakozaki Park. The local drum team joins and play drum for Bon Odori Music. 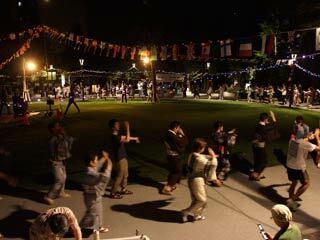 There are many Bon Dancers join and enjoy Bon Odori. Free tea and water are served in this festival, but there is no food stands.